If you were a 4-H member last year, welcome back! If this is your first time to join 4-H, get ready for an exciting year, because 4-H is Fun! 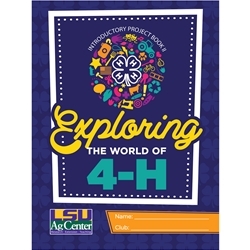 This book will help you explore various 4-H projects. Then, as you continue in 4-H and narrow down your interests, you will be able to request more in-depth project books on specific topics from your 4-H office. Order 100-499 copies and receive a 10% discount. Order 500 or more copies and receive a 25% discount.